I play one episode every Sunday to pace myself. I should be done in two weeks. Spoiler alert for those who did not play the Walking Dead. In violent media research, emotional desensitization is one of the effects after consumption. Studies on emotional desensitization often presented participants with media that invokes emotional states, such as fear or disgust. How these individuals responded to these media give researchers an idea of the individual’s emotional sensitivity, this is usually done through their autonomic responses, such as skin conductance and in this study’s case, pupillary dilation responses (PDR). Under low cognitive load (e.g., when not doing anything complicated or novel), PDR is a good psychophysiological measure of their emotional desensitization. My playthrough of episode three might have temporarily desensitized me in watching Carver’s demise. However, I and many players who chose the same might have a common rationale: Carver deserved what he did. Interestingly, Arriaga and company examined how participants physiologically react to victims of violence under different contexts. Participants: 134 participants, 68 men and 66 women. Most of these participants were college students, average age is 23.19 (SD=4.45). All participants have normal or corrected-to-normal vision. Videogames used: Time Crisis 4 was chosen as the violent video game and Need for Speed SHIFT was chose as the non-violent video game. Play time was 15 minutes. Prior videogame use: Participants were asked to name videogames they played in the past 6 months and how often they played them. The titles were coded for their violent content according to the PEGI rating system, if they contain realistic violence and is rated for 12 years and up. The authors found that half of their sample did not play videogames, thus they separate gamers vs. non-gamers for their analysis. Pupillometry: They used a Tobii T60 Eye Tracker in case you want to replicate the study, also you should have a working knowledge of E-Prime 2.0. Videogame physiological arousal: They used a BIOPAC MP150 to measure participants’ skin conductance level. Emotional stimuli used: They picked 51 pictures from the International Affective Picture System. It is a picture database for researchers’ uses and allows them to compare their results. The images are not typically disseminated online because this would spoil its effects if anyone saw them beforehand. They picked 17 images of negative, neutral and positive valences, respectively. The negative-valence images include scenes of assault, injury, battered women, and mutilations, i.e. victims of violence. The neutral-valence images include scenes of people in nonemotional activities, such as reading a newspaper, factory worker, etc. The positive-valence images include scenes of positive emotions, such as men and women smiling, children playing, etc. Aggressive behaviour: They used the competitive reaction time task to measure aggressive behaviour. Participants were tasked to compete with an ostensible partner in determining how fast they get to blast each other with noise. In each trial, participants set the noise level, from 0 db to 95 db, and noise duration, from 0 seconds to 4 seconds. When ready, they wait for a cue to press a button, once pressed, they either win or lose depending on how fast their reaction was. They get the noise if they lose, or if they win then their partner gets the noise set by the participant. Participants were recruited for three ostensible studies to disguise the true purpose of the actually one study, this is to reduce any suspicions and reactance on the part of the participants. The first ostensible study is to examine their physiological responses in a videogame, participants had electrodes attached to them, participants provided a saliva sample and they played either the violent or non-violent videogame for 15 minutes. After play, they provided another saliva sample. The second ostensible study had participants viewed newspaper pictures of victims of violence and were told their eye movements would be tracked. Participants were shown one picture at a time for 4 seconds. There was a delay of 8 seconds between pictures. At the third ostensible study, they performed the competitive reaction time task. The authors performed a 2 (game condition) X 2 (gamer vs. non-gamer) X 3 (picture valence) ANOVA with PDR as the dependent variable. There was a main effect on picture valence in that negative valence elicited higher PDR than neutral ones, and positive valence pictures elicited lower PDR than neutral ones. There was no main effect for game condition on PDR, but there was a significant interaction effect in that those that played the violent videogame reacted with lower PDR when seeing negative valence pictures (M = 0.48, SD = 0.16) in comparison to those who played the nonviolent videogame (M = 0.55, SD = 0.19). Videogame experience was a not significant predictor nor were there any differences found for positive or neutral valence pictures. Aggressive behaviour was analyzed through a 2 (game condition) X 2 (gamer vs. non-gamer) ANOVA. The results revealed that playing a violent videogame (M 4.64, SD = 2.14) led to greater aggression than that of playing a nonviolent videogame (M = 3.78, SD = 2.21). The authors examined the link between PDR and aggressive behaviour through a correlation. What they found is that lower PDR is correlated with higher aggression. The results are true for both who play the violent or nonviolent videogame, as well as their PDR to negative, neutral and positive valence pictures. They tied all the elements by conducting a hierarchical regression analysis to examine how PDR acts as a mediator between violent videogame consumption and aggressive behaviour. At the first step, they found that playing the violent videogame lowers participants PDR and increase aggressive behaviour. Then, they included PDR as a predictor and found that violent videogame was no longer a predictor for aggressive behaviour, but PDR remained a significant predictor after controlling for game condition. The figure represents what this mediation looks like. My graphical rendition of their mediation analysis. Asterisks indicate statistically significant relation. The standardized regression coefficient between violent videogame condition and aggressive behaviour, controlling for PDR, is in parenthesis. The take home message is that after a 15 minute episode of playing a violent videogame, our emotional sensitive to negative-valence events is lowered or we are emotionally desensitized to others’ pain and suffering. 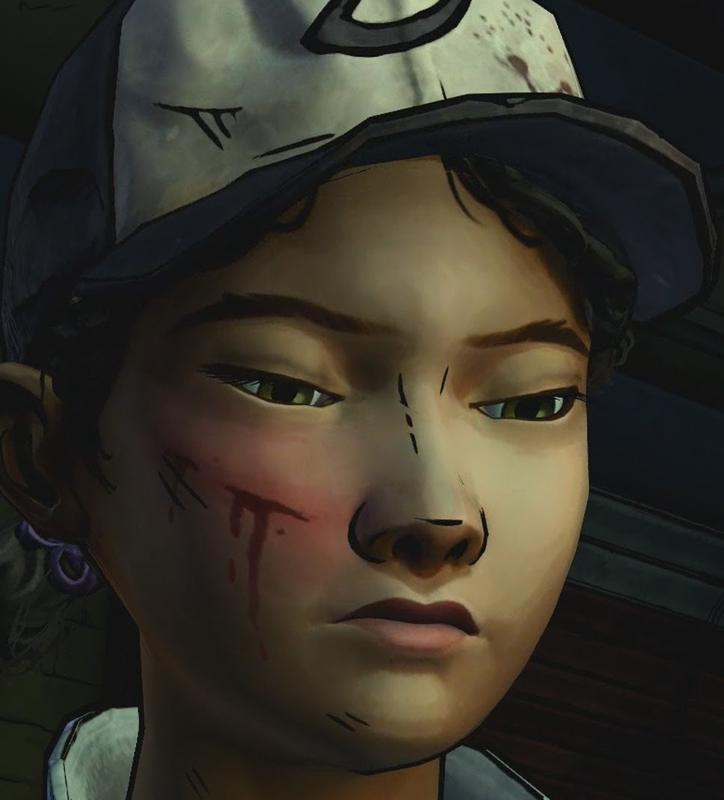 The study’s results pretty much reflect how Clementine flinch much less than I expected while she watched Kenny beat Carver to a pulp. I certainly did not flinch either, actually I was feeling good for meting out retributive justice. This unflinching emotional response to others’ pain translate to greater aggressive behaviours. We physically harm others while our feelings of other’s pain and suffering is numbed. The authors did not found violent videogame experience as a predictor for lower PDR and aggressive behaviour. The authors argued that half of their sample did not play videogames and they essentially split their sample into gamers and non-gamers. The authors argued that it might have been the use of the PEGI system in coding violent content, but I disagree. IMO, this effectively reduced the sensitivity of their analysis as those in the gamer condition could vary in the amount of violence they consume. Thus, I think the possibility of individuals who consume a lot of media violence would lower their baseline emotional sensitivity, kind of being habituated of seeing gore after watching many days worth of horror movies. The authors mentioned the same thoughts about examining those who chronically consume violent videogames. The relation between PDR to victims of violence and higher aggression is in line with previous research on empathy. Most people would inhibit aggressive response when seeing suffering and pain. One explanation the authors brought up regarding the increased aggression is that they care relatively little for the welfare of others and how it leads to an underestimation that aggression will increase the suffering of others. The authors listed limitations about their experiment. The participants were told that all of the pictures were actual victims of violence and this might have impacted their PDR when they were shown neutral or positive-valence pictures and they were more sensitive when seeing negative-valence pictures. Another limitation is whether participants react the same way to other negative valence content, such as seeing a picture of an angry person or seeing someone beating up another. One limitation I’d like to mention is they have not analyzed the skin conductance data, it would be nice to tell the readers if it has any bearing in the study or not. This entry was posted in Aggression, Cognitive Psychology, Video games by Wai Yen Tang. Bookmark the permalink.